Fun and a little hard work. That’s all Tess Haviland had in mind when Ike Grantham paid her for her graphic design work with the run-down, 19th-century carriage house on Boston’s North Shore. Then Ike disappears and Tess finds herself with much more than a simple weekend project to get her out of the city. 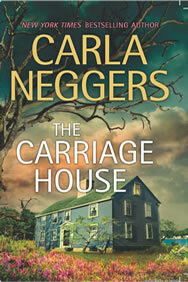 It’s not just the rumors that the carriage house is haunted-it’s the neighbors: six-year-old Dolly Thorne, her reclusive babysitter, Harley Beckett…and especially Dolly’s father, Andrew Thorne, who has his own ideas about why Tess has turned up next door. But when Tess discovers a human skeleton in her dirt cellar, she begins to ask questions about the history of the carriage house, the untimely death of Andrew’s wife…and Ike’s disappearance. Questions a desperate killer wants to silence before the truth reveals that someone got away with murder.